All these years later, I now understand that when Mr. Michele decided to tell me about his life, he didn’t really mean it to be about him but about the millions who didn’t survive. He wanted me to remember the scale and the meaning of the Holocaust. Roll Call: Is Pelosi Still the Gift that Keeps on Giving for Republicans? How effective negative campaigns are or have ever been is open to debate. But there is increasing evidence that tying candidates to Pelosi as a campaign tactic may not have the impact needed to bring a race home for Republicans. Just ask Rick Saccone, the losing GOP candidate in the recent special election in Pennsylvania’s 18th District, whose campaign tried to tie Democrat Conor Lamb to Pelosi. Roll Call: Hollywood Discovers America! Watching Roseanne Barr’s second act last week, I realized as I listened to her character vent about her family’s economic situation that she would have fit right in with most of these voters. Her issues in the sitcom were the same ones that drove the 2016 election — jobs and the economy coupled with people’s growing frustration that their government seems unable to deliver solutions to their problems. Voters, whose mood may be improving, remain skeptical of both parties and this president. What they are saying is that this country is facing serious problems overseas and at home, especially at home. Until the Russia investigations show them something more than they’ve seen so far, Democratic calls for impeachment seem nothing more than shrill partisan rhetoric from a party that still doesn’t understand how it lost in 2016. The Russia story may garner eyeballs and clicks because of its sensationalism, and people believe that the integrity of our elections is important. But they see much of the coverage and the investigations themselves as nothing but partisan game playing, much as voters saw the Clinton impeachment 20 years ago. Viewing the electorate through the lens of issue priorities rather than through demographic variables yields valuable insights. Our analysis suggests that the mix of issue priorities revealed more about voter decision-making than demography. Using voters’ views on the importance of 23 different issues, a cluster analysis produced five distinct groups — the “Democrat/Independent Liberal Elites” (15 percent of the electorate), the “Democratic-Leaning Working Class” (the largest cluster, at 25 percent), the “Moderate Younger Middle-Income” voters (17 percent), the “Conservative Older” voters (21 percent), and the “Conservative Younger” voters (12 percent), with an additional 10 percent unidentified by these clusters because they did not respond to all 23 issue priority questions. These clusters demonstrated distinct presidential election voting patterns, party preference, and ideological patterns that can provide insight into voters’ decision-making. The conservative, Republican-Leaning clusters appear more cohesive than the two Democratic-Leaning clusters. 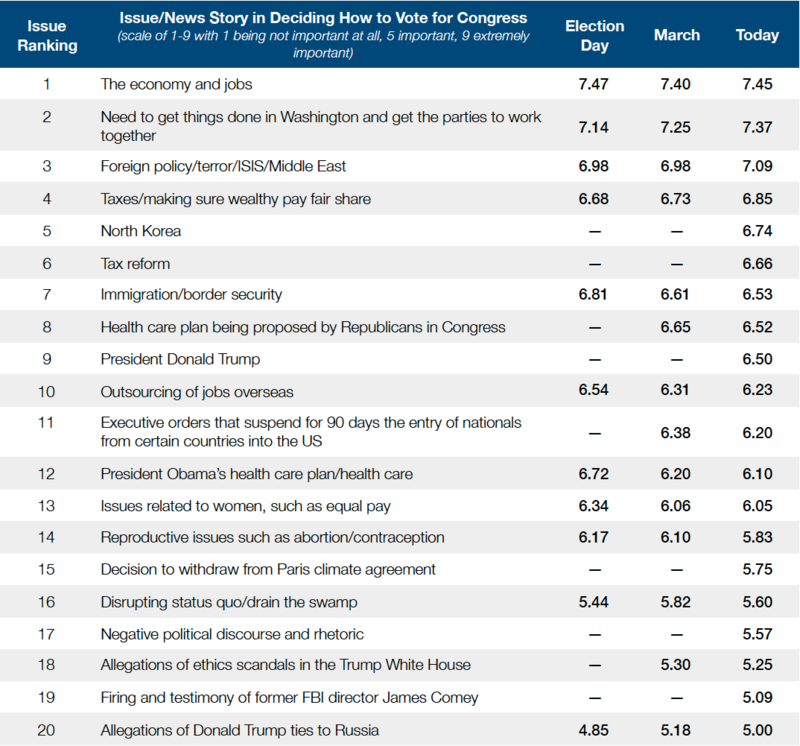 The “Democrat/Independent Liberal Elites” cluster prioritized issues popular in the media coverage of the election, but not issues that were “very important” to the other Democratic cluster and the country as a whole, such as the economy and jobs. These differences will be consequential for Democrats in the future. The key issues driving the election, based on what voters found most important, were the economy, health care, jobs, and Social Security. Issues such as climate change, gender, and racial injustice that made up a significant level of the media coverage of the 2016 election were not among the most important issues for most voters. The Rust Belt was key to the election outcome, and the economy was the top issue among Trump voters in that region, and the fifth most important issue among Clinton voters. Of the four top issues, Trump had the advantage among voters who highly prioritized jobs and the economy while Clinton had an advantage among those who prioritized health care. Neither candidate had an advantage on Social Security. Clinton won a majority of those voters who prioritized 12 of the 23 issues included in the survey, and often by large margins. But Trump won a majority of those who prioritized two of the top three issues, including the most important, the economy. Voters were not satisfied with the status quo when it came to the economy, and deep economic frustration and desire for change underlied their issue prioritization and political decision-making. …In the end, there are two numbers that will matter most in the 2018 election: How many jobs have been created and how much have wages gone up? Transformational tax reform legislation is essential to create the kind of economic growth that delivers both. This is a battle Republicans must win — on the floor and in homes and businesses across the country. Principles are important. But you can’t win without outcome-based policy products that connect with people.